Most 21-year-olds have no idea of what they want to do in life. But Hailey Nault was different -- and determined. She wanted out of her bank job and into the food-service industry she had worked in as a part-time server since age 14. So, when she came across the Pita Pit healthy-eating concept at a trade show, she was hooked. Of course borrowing full start-up funding at such a tender age was a nonstarter. So Nault pursued a different route -- partnership -- and today, at age 22, she has her own restaurant. I have owned my store for eight months now. When you find the right fit of a franchise, it becomes a large family. 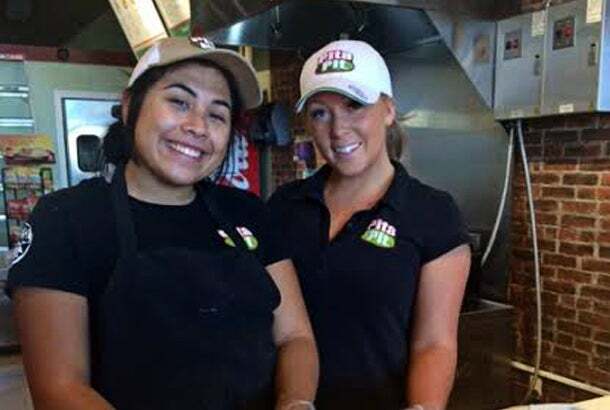 Everyone in the Pita Pit family is looking to help people succeed and reach their full potential. Franchising allows me to be my own boss but still have support and guidance; and with the type of guidance Pita Pit has, you can’t go wrong. Also, I had worked in the food industry since I was young, had played different roles and knew it was something I wanted to get into long-term. Being my own boss was always the plan. I worked hard, and I wanted to strive to do more from a business standpoint than most people my age. Since the time I was 14, I had been working in different restaurants while going to school. I worked for one of the big banks in Canada, TD Canada Trust, until I was 20; it was a safe and repetitive job. But I was still working part-time serving; the food industry was where I was truly happy. After working multiple jobs for multiple years, I wanted to be my own boss, so I started looking into franchising. I attended a franchise show in Toronto when I was 21 and immediately fell in love with the concept of healthy fast food -- Pita Pit really stood out. I had a lot of questions after I attended the show and starting doing some research, Pita Pit was growing rapidly at the time, and personally I loved the product! With Pita Pit still being in the early stages of expansion in Canada, I was able to afford the opportunity. My store was a “take-over” store. I bought it from an existing owner, so fortunately for me, the hard work was mostly done. The build-out/equipment package (which had originally cost $80,000), was completed and up to date. I purchased my location for approximately $200,000 [$Canadian]. When I was at the franchise show, I received a large amount of information. I needed to hear it from someone who had heard the same things I had and had made it a reality. I needed to speak to a franchisee. I knew where the closest Pita Pit was to my home and instantly started making phone calls to find out who the owner was. That person is now one of the most influential people in my life, a business partner named Rob Anderson. I contacted Rob and told him I understood he was most likely very busy, and to get back to me whenever he could and left him my contact information. Not even an hour later he called me, and we set up a meeting to go over all the questions I had. I met with him shortly after, and we talked for a solid couple of hours. He told me all the information I needed to know, including some challenges that were going to be a little tough to get around. The most unexpected challenge for me was definitely my age. It is extremely hard for adults to get approved for bank loans of upwards of $200,000 to $300,000, so how was I going to manage it at 21? This [age factor] in my opinion ended up being a blessing. I went back to the drawing board with Rob on how I could get the process moving along, and he gave me the best challenge I have ever received: to operate his store for a year. If I proved my merit, we would partner on a store together. After I had succeeded, and had run Rob’s store for a year, we partnered together on the store I have now. I would say the biggest challenge now is staffing; however, it is my favorite challenge because it allows me to grow with my staff and makes me a better boss, friend and business owner. Being only 22 when I took over my store, I found that many of the people who applied were all about my age. At first it was hard to make sure they saw me not only as their friend, but also as their boss. However, now I have a fantastic team that I classify as "family." Sure, I was a little naïve about how many small things could go wrong, from water heaters breaking to running out of lettuce! But those are the learning curves for any business. Do it! Eliminate fear and work hard; hard work always pays off. And nothing is more rewarding then working for a business that you own! Also, do your research, talk to people and ask questions. That’s how you will find out if it is the right fit for you or not. To grow! To take my amazing team and help bring them to their full potential, in any way possible. To continue growing sales and becoming as strong a business owner as possible. We are also looking into expansion. When I came into Oakville I had nothing better in mind than to take a city with only two stores -- Burlington having more then five, Hamilton, more then six -- and expanding wherever there was an opportunity. I am actively looking with my business partners for a second location in the Oakville area.